At the Center for Victims of Torture, we work with torture survivors every day in locations around the world. We are humbled by the hope that brings torture survivors to our doors as they seek healing. We’re inspired by the hope they share with us as they rebuild their lives. We see hope each day. As we celebrated our 30th anniversary in 2015, we took the time to think about the importance of hope for CVT clients and in our work every day. We thought about what hope means to torture survivors and to our wider community. To share our commitment to hope, we reached out to others and asked them to share their ideas of hope with us. We received an amazing response. From around the world, people sent original photos, poems, essays and messages of hope, which we published on ItStartsWithHope.tumblr.com. Thanks to long-time CVT volunteer and author Ted Bowman, the Minnesota-based publisher Nodin Press agreed to publish a printed collection of these images and words. Nodin Press not only agreed to publish the anthology, but they are also giving all royalties from sales to CVT. We are enormously grateful to Nodin Press for their generosity. It Starts with Hope is a beautiful collection of inspiring messages and images – it allows the reader to take the time to enjoy a moment of hope. 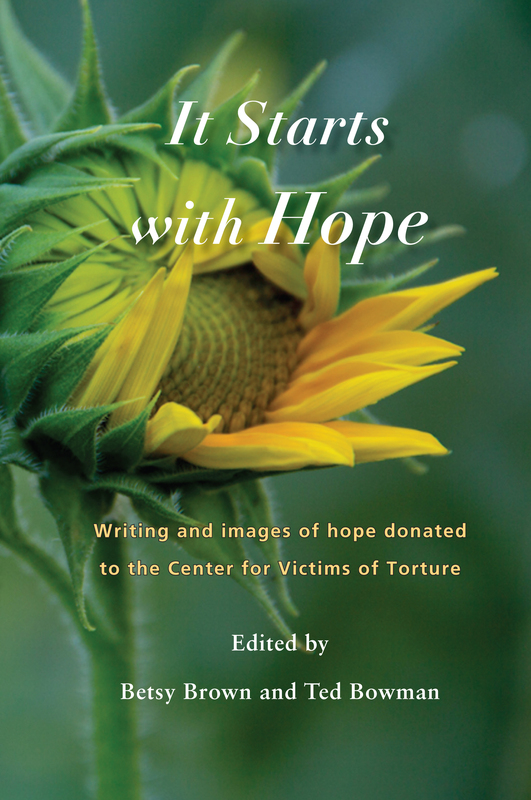 CVT is very grateful to all our contributors for creating this beautiful work, and for their engaging spirit of hope. You can order the book here on Amazon.com or here at Itasca Books. The book is $19.95 – all royalties from sales will be given by Nodin Press to CVT. Visit the It Starts with Hope Tumblr site here.